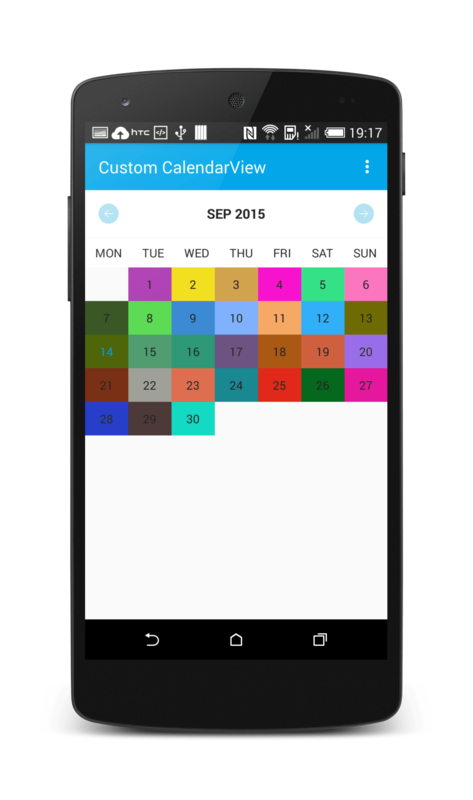 The CustomCalendarView provides an easy and customizable option to create a Calendar. 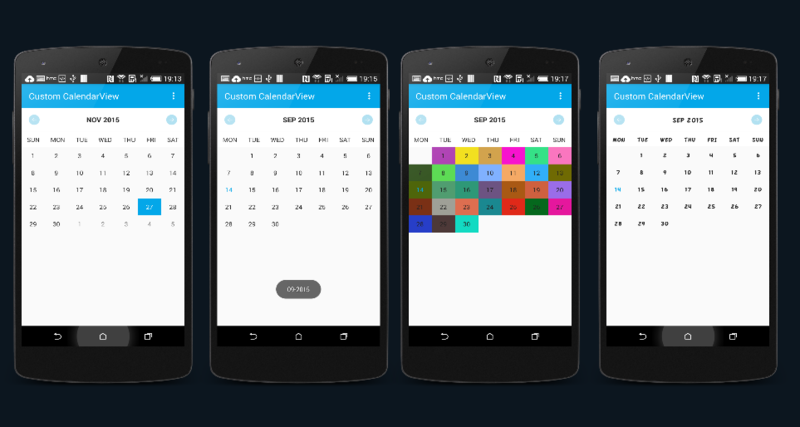 It displays the days of a month in a grid layout and allows navigating between months. Set custom typeface using setCustomTypeFace() method. Unlimited customizations for day of the month using custom Decorators. Allow you to handle event when user changes month and day selection. This library is compatible from API 14. To use the CustomCalendarView in your application, you first need to add the library to your application. You can do this by either from Gradle, Maven or by directly downloading the source code form GitHub. libraryDependencies += "com.github.npanigrahy" % "Custom-Calendar-View" % "v1.1"
The GitHub project source includes a sample application, that is used for demonstrating the various features currently supported by this library. Once the library is added to your project, you can include the CustomCalendarView into your activity/fragment layout using the following code snippets. The above code snippet will show the simple Calendar View with default design. Now, you can use the following attributes, to customize the appearance of calendar. Let us now, initialize the calendar view to control the various other appearance and behavior of calendar using the following methods. Example2: How to Disable Past Dates in CustomCalendarView using Decorators. If you enjoy this library, don’t forget to like our Facebook page or follow us on twitter @Stacktips. I’m using calendar in Polish language but some of day’s names are written with capital letters, some with small letters. How can I fix it? Can I change names of days and months or just delete them? There is any way to initialize the calendar with day that is different from the current day? I tried to use the instruction but it open with the day I chose but still mark the current day with the actual one and not the one I want. Hi! Why does the theme for my entire app change when I put this in my repository and dependencies? how to add events or color on particular days / dates. Hi great tutorial sir , can I get the date data in database then mark it in this custom calendar? Thanks James. You may use the DayDecorator to do styling using Spannable. Thanks Joe. Glad it helped. Can you please paste code to add dot or image to the dayview? Can you please share the code to update the date cell please? how to disable previous dates from current date..sir can you help me out..
Can u help me out please..its urgent..Thanks in advance..
@prachi_karapurkar You’re welcome. Happy that helped you. how to add this awesome lib on Eclipse? Currently we do not have the Eclipse portable project. You can build a JAR out of the library and add it to your eclipse project lib directly. Great library. Does all basic stuffs you need. However it doesn’t support week view. Currently the library is not supporting the week view layout. Currently it is not supporting localization. hey Nilanchala Panigrahy am developing app and i want to add public holiday list in it then can you give some hint how can i implement that?? I need your help in decorating my own specified date. Similar problem as Humayoon. I will be really greatful if you can share this code. Hi Humayoon, please can you share the solution with me? Yes, I also would like to change the color of a specific date I specify but it only changes the date of today. Please help with the code for changing the color of your own specified day of the month. Hi Cesar, This is a known bug. Will fix it in my free time. and i want to ask could i add item list under the custom calendar view which is contains our schedule? You can absolutely do that. 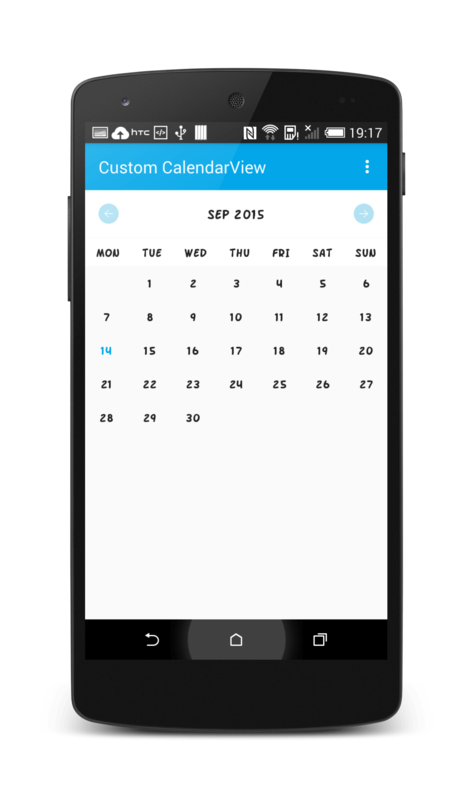 For that you need to add the CalendarView to list header. Hi Amit, unfortunately currently it is not supported. Can I change the month by scrolling down in this calendar? Hey @disqus_dz0L9TTcVs:disqus. Currently the calendar view is not supporting scrolling down. I need to customize sun,Mon,tue… Sat ,like some special text (Ex: 1,2,..7),how I need to replace ?please guid me,your response will appriceated. Hi , i want to display round background with color to the particular day. Hi Nilanchala, thanks for the library. I have a simple question: How do I retrieve a particular DayView corresponding to a date in my activity class? is it possible to show month like 26 feb to 26 march ? You need to implement DayDecorator. See the example in the comments above. Can you do a pull request and modify. Once you done, I can merge it back to trunk. its not working can u please help me out..
What is not working? Can you be more specific ? Is is possible to show only months of the year and days of the week in this library?? currently not supported. You need to extend the library. Is it possible add small text to Dates in calendar. I have database with 2 columns: date and name. How add this columns (arrays) to calendar? i want to change the color of current week.how it? check the example in this library and previous comments. This a awesome lib thank you for creating such a awesome one, But how to use decorator for specific date ? can you please post a example on that , if i want colour a specific date on calendar (Like Public Holiday) how can i achieve this ? ArrayList error occured “Diamond types are not supported at this language level” and ColorDecorator() class can not resolved. i need to implement background icons instead of colors in decoraters.Can you help me?